I would be lying if I said I didn't see a proposal coming. I just didn't know when it was coming. And though I must admit I am usually hard to surprise, I didn't see it coming when it finally did. Christmas Eve 2003 Kevin and I were getting ready to make the rounds. We had and still have a tradition. On Christmas Eve we open one gift from each other and we open the rest on Christmas day. We each picked the gift we wanted to open and sat in the couch. As I opened my present I started to chuckle...it was a small stuffed cow. (remember what I told you to remember form yesterday's post?) But when I looked up I saw Kevin kneeling before me and then put it all together. That's when I saw the beautiful princess cut diamond hanging from the cows neck. My eyes welled up almost immediately and while I wish I could remember exactly what Kevin said, all I know is I felt like I was floating on air. After I said yes and I composed myself I asked him what he would have done if I picked a different present. He replied, "I just knew you'd pick the right one." And I did. On so many levels. 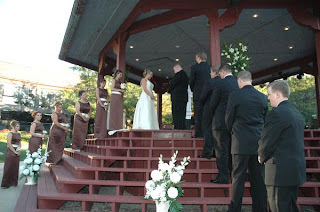 On September 17th 2005, I married my best friend. In the midst of planning our wedding, there was a lot of opportunities for doubt to creep in. Marriages around me, including my own parents, were falling apart left and right. Couples that had been married for 20-30 years were suddenly calling it quits. There were days I wondered how they got there. Surely they were blissfully happy like us at some point. What made them decided to walk away from it all 20+ years later?? I thought about those things from time to time, but I refused to let the "what ifs" consume me. This marriage is about Kevin and I and nobody else. The successes and failures of other relationships have nothing to do with ours. So here we are 5 years later. And aside from the addition to our family, I can't say much has changed. Sure we have our moments, but we try not to let the little things add up to big things. We try to find time to cuddle, even if we can barely stay awake. And when we kiss I still feel butterfly's. Sure there are sometime moments when I want to strangle him, but they are few and far between. Over all I feel overwhelmingly lucky. Lucky that we can sit and silence and be comfortable. That we can communicate without saying a word. Lucky that I can always count on him to clean the bottles because I hate to. And he can count on me to clean the bathroom. Lucky that he makes me feel like the most beautiful woman in the world every. single. day. At 5 years I know we haven't even come close to reaching the "meat" of our relationship. I know that there are no doubt more hurdles in our future. I know that our relationship will probably be tested in ways we can't even imagine. How will it all play out? I can't say. I'm not naive enough to think I can predict the future. All I can do is focus on the here and now...and try my best to savor every single second of it. Tonight for our Anniversary we are going to see Jason Mraz and Dave Matthews at Wrigley Field. I'm am hoping Jason will play "Lucky" for me!! The final to this saga is coming in November. You don't want to miss "And then came the Baby in the baby carriage" .